We typically think that climate change is something brought on in modern times, but as an enormous and violent thunderstorm raged in the countryside of central Europe on August 3, 1562, destroying crops, vineyards, and farm animals alike, it heralded another climactic anomaly. From 1300-1850 Europe and North America were ravaged by deadly weather catastrophes that became known as the Little Ice Age. Droughts, deadly thunderstorms, freezing winters and advancing glaciers caused massive devastation. These were times of abject desperation, and everyone — most especially peasants — sought to understand this. However, it was also a time when climate science was lacking and superstition abounded. Demoralized by the tempestuous weather, peasants began demanding quick action from medieval courts. 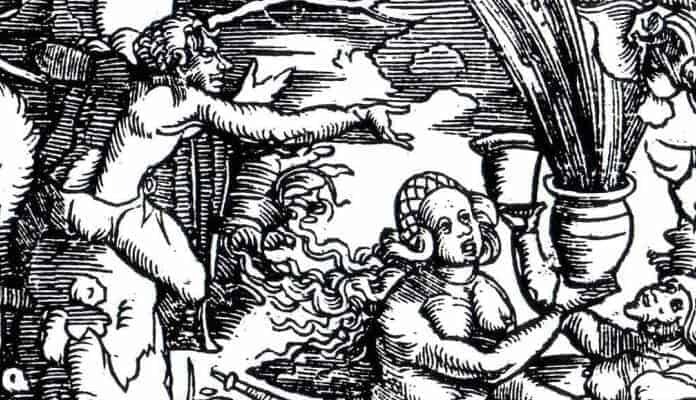 Many were spurred by the belief that witches and sorcerers could “make weather” and steal the milk from starving cows.